Digital Content intern George Davies worked at THSH for 10 weeks on the #THSHLookingBack series, a series about Town Hall's history as a centre for suffragette activism in the West Midlands. Here, he explains a little about his work on the project. As an English student at UoB with a background in historical research, I was very excited by the opportunity to use my existing skills to uncover an important history and explore the past of one building in one city in a very deep and involved way. I undertook a historical research project last summer as part of my university're Undergraduate Research Scholarship. There I developed research skills to use investigating the history of suffragette activism in Birmingham. Academic and especially historical research is only ever achieved by “standing on the shoulders of giants”, so in this blog I want to acknowledge the sources and influences which were so instrumental to producing this project. I started with two books: Town Hall Birmingham: A History in Pictures and Birmingham Town Hall: An Architectural History which my supervisor put out on my desk ready for day one. There’s still a little sticky-note on them which says ‘Monday’. I also looked at articles that had previously been written for the THSH website about suffragette activism, for example last year for the centenary of the Representation of the People Act which first gave women the right to vote. I looked at other websites too, including the BMAG and the Birmingham Mail – places with an interest in promoting local history. Two books in the Library of Birmingham’s Birmingham Collection were absolutely essential. The first was Elizabeth Crawford’s From Frederick Street to Winson Green: The Birmingham Women’s Suffrage Campaign. One of the opening sentences of Crawford’s book says “it is interesting to trace the growth of the women’s suffrage movement in Birmingham through the streets and buildings in which the men and women of the city conducted their campaign” which is hugely appropriate for a project exploring the rich history of suffragette campaigning in Town Hall – lucky find! Second was Nicola Gauld’s Words and Deeds: Birmingham Suffragists and Suffragettes 1832-1918. Elizabeth Crawford’s book was only short so didn’t take very long to read in its entirety. Nicola Gauld’s book was more substantial but had an index with a dozen references to Town Hall which made it very quick to record everything relevant. Thank goodness! I made a list in chronological order of all the events at Town Hall, with the dates on which they happened to make my later archival work a lot easier. I then took this list to several archives, including the Wolfson Institute’s Birmingham-related archival materials in the Library of Birmingham, the British Newspaper Archive and the Birmingham & Midlands Institute, whose Birmingham Library holds decades of back issues of two Birmingham-based satirical newspapers: The Birmingham Owl and The Birmingham Pictorial and Dart. For all of these I just inputted dates I knew suffragettes were organising in Birmingham and requested any materials from around those dates then combed those materials for references to our suffragettes. This yielded a lot of fascinating first-hand accounts of the events which, with a little fussing about copyright, I was able to add to the blog posts to bring a lot of added colour to the story. The further you go back in time, the less widespread photography is, and so the harder it is to find relevant images. What’s more, archives have traditionally been maintained by men of a certain class and education, and so the decisions about what deserves to be recorded and preserved has historically been biased. Just look at Parliament Square for example, where 11 statues of men which stood in the capital since the 1830s where only joined by a statue of a women this past year. For the 1910s and 1900s, and especially the 1880s and 1870s, it was very difficult to find photographs of specific events. To make sure that articles in the series had some visual content to go along with the textual information, I mostly used the LSE Women’s Library’s Flickr for pictures of the individuals involved in events I was talking about, with the permission of the Women’s Library’s head librarian. I couldn’t find any photos at all of Eliza Sturge, secretary of the BSWS, not even in the Wolfson Centre of Birmingham materials - despite the fact that her uncle, Henry Sturge, has a statue at Five Ways. Archives have a reputation for being fusty and inaccessible, but that’s part of the reason for a recent drive from a lot of different groups to open them up more. It’s amazing how much history can be right at your fingertips. Finding something that was printed before your great-grandparents were born, that people might not have set eyes on for decades or even centuries, is a totally unique feeling. Sometimes just Google-ing something like ‘Women’s Victory Rally 1946’ (I saw a poster in Town Hall: A History in Pictures) turns up a programme that someone had bequeathed in their will to Sandwell Community History Archive Service! I was able to photocopy it and include it in an article for some interesting authenticity. My time at THSH was limited, as I was only working 2 days a week for 10 weeks. With more time on the project it would have been useful, not to mention fascinating, to have found a suffragist newspaper and how they talked about the Eliza Sturge and Catherine Osler events, or even how they responded to suffragette militant activism in Birmingham. I mistakenly believed a 20-day internship didn’t have the scope for a trip to London, so missed an opportunity. I could have visited and made use of the extensive archives of the Women’s Library at the LSE in person, for example to read reports and letters from the Birmingham Society for Women’s Suffrage, of which Eliza Sturge was secretary. I did find a letter from Eliza Sturge in the Wolfson Centre thanking someone for a donation to the BSWS. Unfortunately the copyright didn’t expire until something like 2050, so I couldn’t use it in the project, but it was really interesting to read something in Eliza Sturge's own handwriting from 1872! Towards the end of the project, I actually got to talk to Dr Nicola Gauld as she works at my university. An interview I recorded with her in Town Hall provided footage for several very informative videos for THSH’s social media. I also got interviews with Dan Snow and Dr Helen Pankhurst as they were both in Birmingham to give tours, the former as part of his national tour; the latter addressed several panels at a West Midlands Women’s Voice event held on Wednesday 6 March, ahead of International Women’s Day. Interning at THSH on digital content and social media has been a really great experience, both in furthering my interest in archival research and my skills in communications. From world-renowned classical, rock and pop artists to award-winning comedians, you’ll see performances that entertain and inspire you. 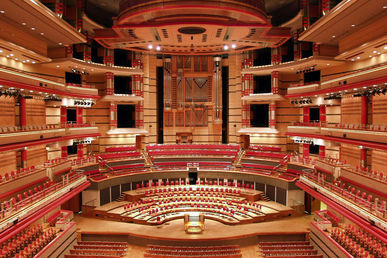 The legendary saxophonist performs at the CBSO centre this May. Did you know that Tower of Power featured in these six famous songs? Trevor Burton, co-founder of iconic Birmingham sixties band The Move will receive a coveted Lifetime Achievement Award at the Birmingham Music Awards next month.